Sustainability doesn’t stop with fashion. In the beauty world, I also appreciate clean, non-toxic beauty brands that are transparent about their formulations, which is always a plus to know exactly what we’re putting on our bodies. Traditionally, we might think that natural makeup are not as pigmented in comparison to products that are more synthetic. 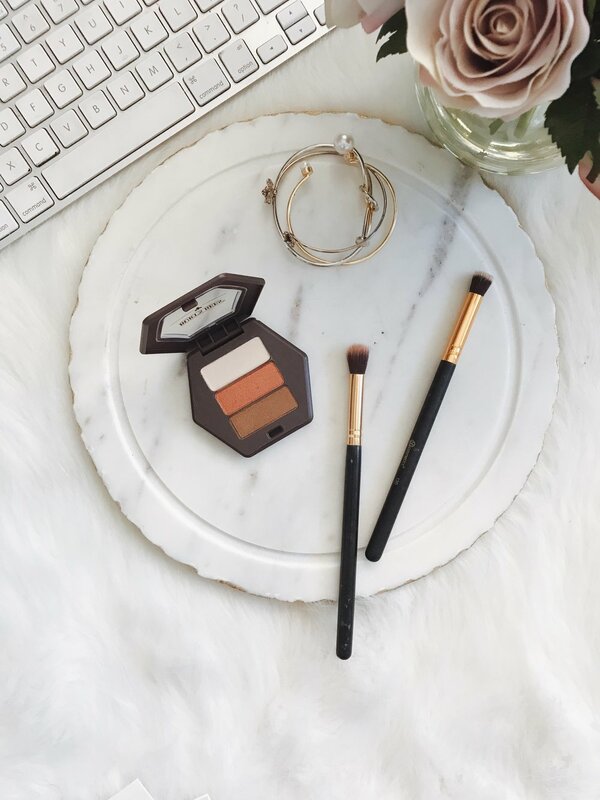 There are many brands in the market now who are creating makeup that is rich in color, applies beautifully, and long wearing compare to their more synthetic competitors. In the pursuit of living more naturally and conscious of our environment, I’ve put together a list of few natural beauty brands that I have tested and fell in love with. These brands range from different prices and types of products they are known for. I’d love to know what are some of your favorite natural beauty brands, so feel free to share with me by leaving me a comment below. Before we jump into the product, can we first take a moment to appreciate the beauty of their minimalistic yet chic packaging. 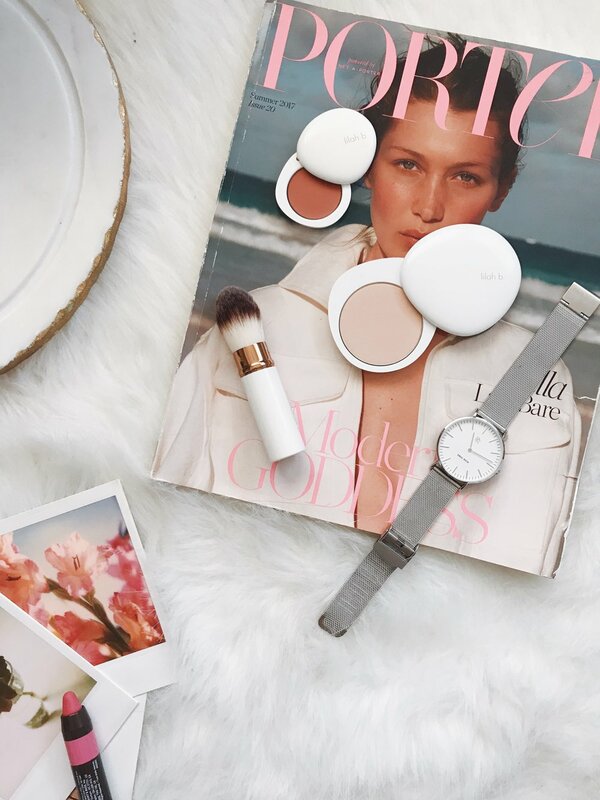 The popular swivel compact that houses the products feels so luxurious in your palm, a perfect addition to both your vanity and beauty collection. Lilah b. is all about creating simple, multipurpose beauty products with clean formulas. Their products also don’t contain any gluten, sulfates, or parabens, and packed with aloe, coconut oil and agar that are actually good for your skin. For any busy gal who’s always on the go, multi-purpose is the key to my heart and my wallet. For people with oily skin (me, me, me), this foundation is perfect for you. It’s super lightweight, which makes you feel as if you’re not wearing any makeup at all. The coverage is also buildable, so you can use it alone or with other foundation for a fuller coverage effect. The aloe ingredients also has soothing and moisturizng benefits, leaving your skin feeling light and silky smooth even without a primer. It’s also a great on- the-go compact to throw in your purse whenever you need touch up on your makeup throughout the day. I also like to apply the foundation with their Retractable Foundation Brush. The compact design keeps it clean and portable, perfect for any makeup bag. The brush is also ultra soft, it feels so good against your skin, making the application so easy and flawless. Anything that’s multi-purpose, I LOVE! This creamy, long-wearing lip and cheek duo has a matte finish and comes in 5 different shades. The shades are much closer to stains than balms and go on as thin-but-buildable coats. I always like to use my finger to apply, but I’d suggest to pick up a lip brush for a more precise application. As a blush, it blends out seamlessly onto the cheek, and gives a very natural look. SPELA is a US based brand that is committed to create high quality formulas that are vegan, cruelty free and non-toxic. Especially for lipsticks, something that we all unconsciously eat all the time, so we have to make sure our lipstick is formulated as safe as possible. The brand’s lipstick has total of 8 different shades ( I am hoping to collect them all so I can do color swatches for you all). I was very impressed with SPELA’s matte liquid lipstick when I first tried it. Usually, matte finished lipsticks are dry and always leave my lips chapped, but not SPELA’s. SPELA’s liquid formulation is light weight and creamy, although it’s liquid, it does dry up fairly quickly after you apply while still leave your lip feeling nourished. The pigmentation is also amazing and good for long wearing, a single stroke is all you need for full coverage. For darker colors, I normally only apply one layer. But anything that’s lighter, such as the color pictured, I’d suggest to build the coverage for a more saturated look. The formula also lasts all day and never bleeds, I haven’t had to reapply even after consuming food. One of my favorite color to wear for spring and summer is this pale rose called Flirt. The soft pink is a perfect everyday lip color that can take you anywhere you go. The formulation is also enriched with vitamins C and E that enhance the longevity of the lip and add the benefits of antioxidant protection. Burt’s Bee has been around as long as I can remember, this family oriented brand has been taking care of our bodies from head to toe for 30 years now. When I first heard that Burt’s Bee is coming out with their own beauty line, I was so excited! Finally, something natural for my face at affordable prices. Earlier this year, I was very lucky to meet the team and the amazing artists who helped to develop the make up line at Burt’s Bees. They introduced me to their 7 product categories ranging from lipstick (of course), eyeshadow, mascara, brow pencils, foundation and etc.. All the products are close to 100% natural and free of parabens, phthalates, SLS, petrolatum, talc, synthetic fragrances and silicones. It’s also great to learn about the ingredients that go into making these products, which reassures my confidence in choosing Burst’s Bee as my go to for beauty products. They really stayed true to their roots by providing natural care for our bodies with results and good ingredients. Burt’s Bees Eye Shadow comes in total of four color palettes, each inspired by nature. I absolutely love this Blooming Desert eyeshadow trio! I have black hair, brown eyes and fair skin tone, so I personally prefer earth tone eyeshadow color palette for more natural everyday look, subtle and not over powering. All three shades are warm color with a tiny bit of shimmer in them, which gives your eyes a natural glow. The combination of the 3 shades creates a beautiful look with lots of depth and detail. This trio is great for highlighting my features and my brown eyes. I usually apply the orangey bronze shade over my entire lid, the color is not as pigmented as I'd like but it’s buildable. Then I apply the dark brown shade to my eyelid crease and use the cream color as a highlighter for my eye inner corner and brow bone. For a finishing touch, I like to use a liner brush and apply the brown shade along my outer eye corner for a more defined look, especially for a night out. The palette size is also good to carry in your purse for touch up at any time. To go along with the shadows, they’ve also introduced three smudge-resistant eyeliners pencil. The nourishing jojoba oil enhances the smoothness, so that it glide on nicely to create a defined and controlled line. I already finished my eyeliner pencil, so it’s not pictured here. Another thing I want to mention about the eye liner is that it’s smudge free and long lasting wearing. Due to the nature of my thin double eye lid, I have struggled for a long time to find a eyeliner that doesn’t smear or smudge. Burt’s Bee’s eyeliner pencil does the job, I can wear it all day even during the summer with humid weather, it doesn’t smudge at all. My eye makeup stays in tact all day without needing any touch up. It’s also safe for sensitive eyes and contact lens wearers. Now let’s talk about my absolutely favorite product from Burt’s Bee, the Glass Lip Crayons. These lip crayons have a glassier finish compare to their original matte back in 2014. I like the ease of application, you can just twist and get the color, shine, and moisture in one swipe. So with this lip crayon, I don’t even have to carry my lip balm anymore, it’s what I call the best of both worlds. These lip crayons have the pigmented colors as a lipstick but also packed with moisturizing ingredients for your lips like Jojoba Oil, Kendi Oil, and Shea Butter. It feels creamy but not thick or greasy. It’s not completely shiny finish as you’d expect from a glassy lipstick, instead it has a bit of sheen which gives them that clear lip glass finish look. Although the color is incredibly pigmented, it does wear off after couple of hours especially after consuming food. I’d suggest to have it handy in your purse for touch up throughout the day.